Huron Employees Volunteer Time on Day of Service to Give Back to 51 Communities Worldwide | Huron Consulting Group Inc.
CHICAGO--(BUSINESS WIRE)--May 17, 2017-- Global professional services firm Huron (NASDAQ: HURN) carried on its six-year tradition of giving back to the community with its annual day of service on Friday, May 12. 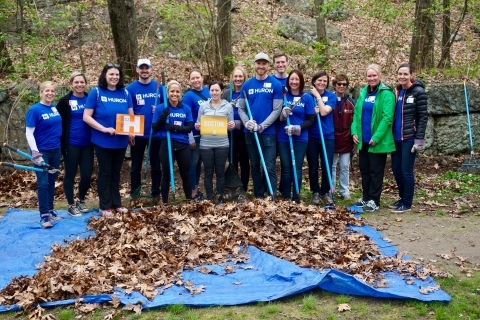 Employees took a day away from the office to lend a hand in their local communities. This year, 1,500 Huron employees volunteered with charities and nonprofits on more than 100 projects to help prepare 600 warm meals, beautify 17 parks and neighborhoods, mentor more than 400 elementary school students and provide hundreds of families with access to food, shelter and other necessities. Huron engagement teams partnered with clients to work with Urban Mission, which provides food to low-income families, and Safe Haven Family Shelter, an organization that serves the homeless. Employees also spent time at the Ronald McDonald House, Boys & Girls Club, Feed My Starving Children, the American Red Cross, Meals on Wheels, Habitat for Humanity, SAGE, Cradles to Crayons and the Alzheimer’s Association. In addition to the projects completed in the U.S., Huron employees across the globe, including employees from the recent acquisitions of Pope Woodhead, Innosight and ADI Strategies, donated their time to projects in the UK, Canada, Singapore, Switzerland and India.